Timing belt replacement shop in Kent, WA. All makes & models. ASE certified auto repair technicians have the training, experience, and equipment to correctly do timing belt change in Kent WA. How Much Does Timing Belt Replacement Cost? We specialize in timing belt replacement in Kent WA so we can provide the best timing belt replacement price. When you compare timing belt replacement price in Kent WA make sure the quote includes ALL required parts. Most manufacturers recommend replacing timing belt tensioner roller, timing belt idler roller, and water pump at the same time to save on future repair costs. Some vehicle manufacturers recommend the timing belt pulleys be replaced at same time as the timing belt. It is also best practice to replace the thermostat and accessory or serpentine drive belt. There is no visual timing belt inspection required. Timing belts have a scheduled replacement life specified by your vehicle manufacturer (check your vehicle user manual). Recommended timing belt replacement interval is usually 60,000 to 100,000 miles depending on the vehicle and engine. Just contact us and we will look it up for you. How Important Is Timing Belt Replacement? Timing belts become worn over time, cracking, delaminating, and eventually breaking if neglected. Distance driven, age, and oil contamination all contribute to timing belt breakdown. If your engine has timing belt noise don't ignore it! Timing belt replacement is a critical service requirement. There is no way to measure or judge the remaining life of a timing belt. If the belt breaks the engine will not run and usually results in serious engine damage. We highly recommend a timing belt replacement according to your vehicle’s factory recommended maintenance schedule. The timing belt is a toothed rubber belt that turns the camshaft which opens and closes the engine valves. Timing belts have replaced the metal timing chain which was used in the past. The advantage is a quieter engine and lower manufacturing cost. 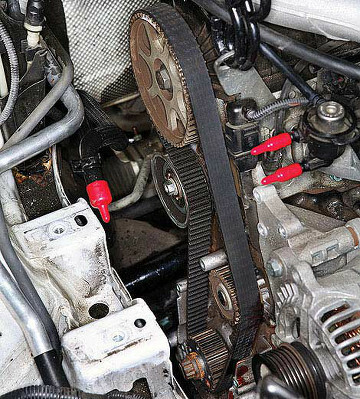 Timing belts are also usually much cheaper to replace than a timing chain. Don’t risk a roadside breakdown. There are no warning signs before a timing belt fails. When a timing belt breaks your vehicle will quit running immediately. Your only remedy is a tow truck and an unexpected repair bill for an engine replacement. Do your wallet a favor and let our auto repair technicians replace your timing belt. We will confirm the recommended replacement interval and correctly install a new timing belt. Inspect for oil and coolant leaks (Leaks must be repaired before the new timing belt is installed. Oil and engine coolant damage the timing belt.). Remove and replace timing belt, water pump, pulleys (if required), and belt tensioner. Start engine and check for proper engine operation, check/adjust ignition timing (if required), and check for cooling system leaks. It is strongly recommended to replace the timing belt tensioner and water pump when replacing a timing belt. If the timing belt tensioner should fail after only replacing the belt, it can cause serious engine damage. The timing belt and tensioner should be replaced as a set. For vehicles where the water pump is driven by the timing belt (true for 60% of vehicles), replacing the water pump at the time of the timing belt replacement is good value and can save you a significant future repair bill. Labor cost is usually the largest part of timing belt replacement cost. If the water pump fails before the next timing belt replacement is due you will have to pay the labor to remove the timing belt in order to replace the water pump.